The aloe vera juice I’m talking about here isn’t the suspicious green goo from the drug store—it looks more like water. If you have an aloe vera plant of your own I’d recommend saving that for direct applications rather than puréeing it and straining it for this as I find self-extracted aloe vera has a very short shelf life. Anyhow, I doubt the benefits of aloe vera juice will surprise you. 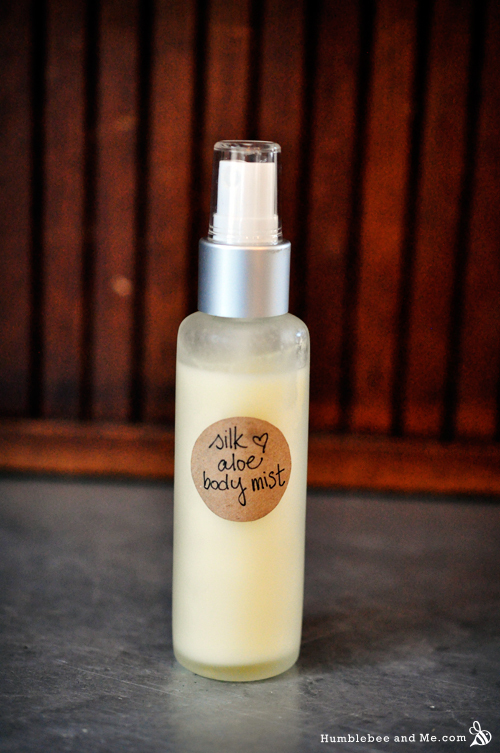 Aloe vera has been valued for centuries as a fantastic healing, soothing, and moisturizing agent, so it’s no wonder I chose it as the base for this mist. Up next, a bit of silk. Silk peptides are the middle-of-the-road as far as silk particle size goes. 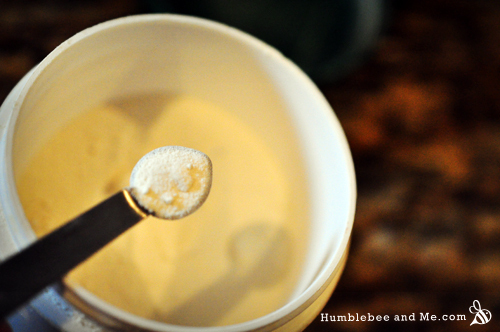 You can also get silk powder (bigger) and silk amino acids (smaller). All that matters here is that the silk is water soluble, as we’re dissolving it into the water. 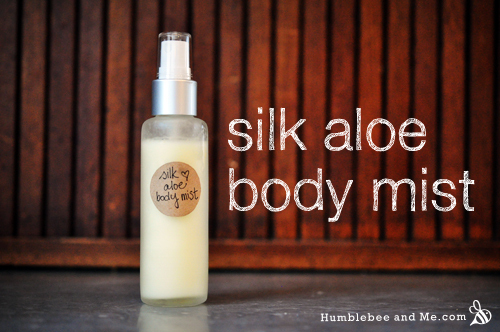 Silk is a natural protein and a natural moisture management system, which is really neat. 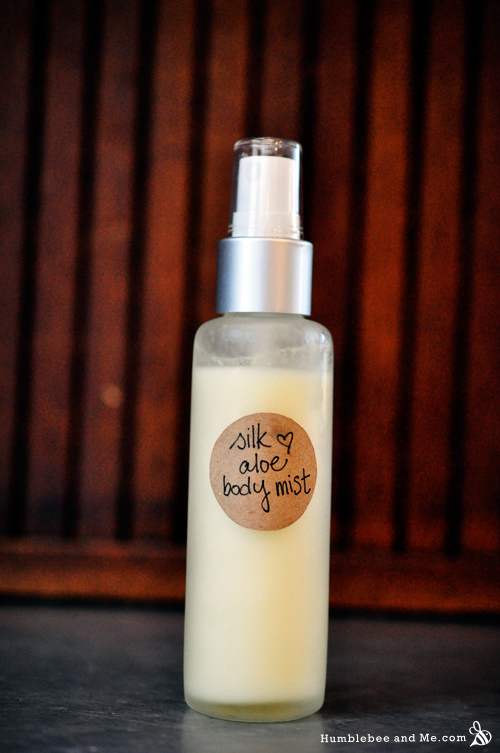 Its chemical composition is close to that of human skin and hair, meaning silk helps damaged skin re-generate. 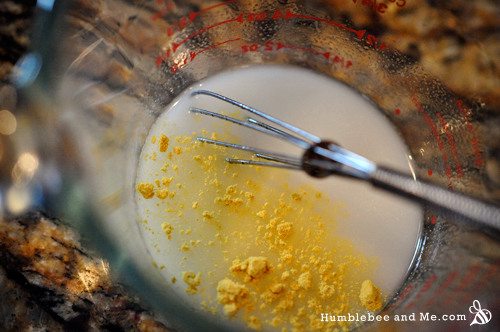 We’re also dissolving in some bee pollen, which is an extremely rich source of protein, vitamins, and minerals. The precise composition will depend on where the bee pollen is from, but you know it’s loaded with amino acids and B-vitamins. Multifruit BSC in a natural source of plant derived alpha hydroxy acids. AHA’s promote cell renewal and are soothing—a perfect post-sunburn ingredient. For essential oils I’ve chosen peppermint, lavender, and chamomile. Peppermint helps cool uncomfortably warm skin, while lavender and chamomile soothe the skin and encourage healing. Now, you might be wondering what’s emulsifying the essential oils into the water base, and I’m excited to introduce a new chemical free oil-in-water emulsifier—guar gum and Turkey red oil. Guar gum is a thickener and natural emulsifier, and Turkey Red Oil is castor oil that’s been treated with sulfuric acid so it self-emulsifies in water. Together, the two give liquids a bit of body and blend in small amounts of water. No solubilizer needed 🙂 Sweet! Measure the aloe vera juice out into a bowl. Sprinkle the guar gum over it and whisk it in. 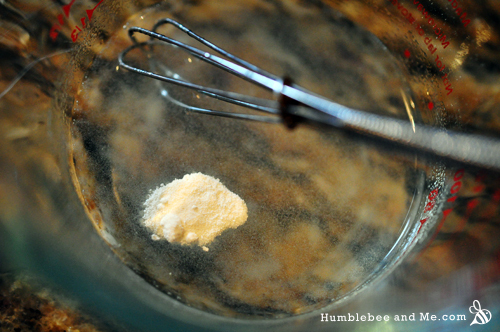 It will clump if you just dump it in, so do your best to sprinkle it across the liquid as thinly as possible. Up next, whisk in the silk and bee pollen. I found a mini milk frother to be super useful here, as the bee pollen wasn’t all that interested in dissolving, despite being water soluble. Stir in the multifruit BSC if using. 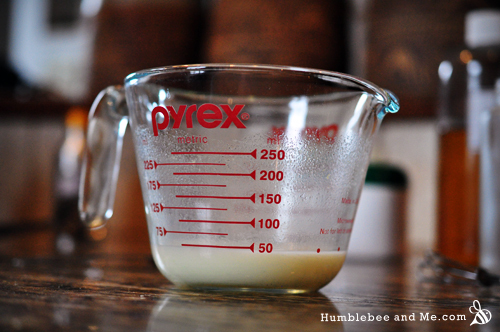 Add the Turkey Red Oil, essential oils, and preservative, and whisk to combine/emulsify. Decant into a 50mL spray bottle. You can store it in the fridge for an extra cooling punch and extended shelf life. How quickly are you finding things like water based spray and lotions molding? Have you tired the liquid leucidal yet? I am a bit skeptic of the GermAll Plus I ordered, but water based lotions are going moldy way too quickly for my liking to use nothing. Hi Hilda—it depends hugely on storage. Pump-top and spray bottles tend to do quite well, with lotions lasting around 6 months and sprays lasting upwards of a year. 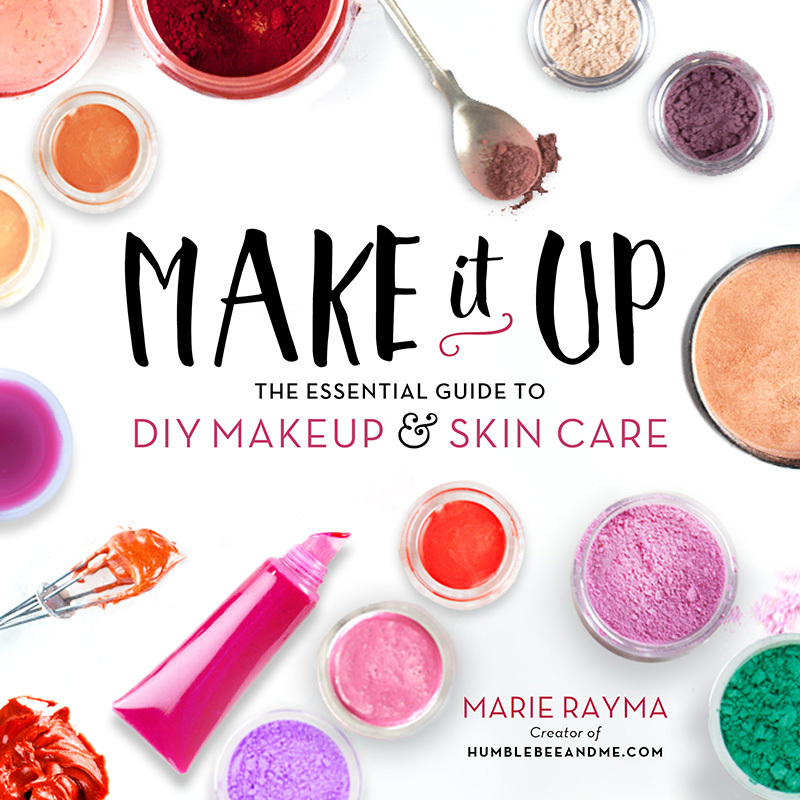 Another factor is definitely the ingredients—I’ve found lotions and sprays that feature homemade infusions for the base (like oat milk or homemade rose water) mould much faster. Anything you dip your fingers into won’t last long at all without a preservative (less than a month in my experience). I haven’t tried liquid leucidal yet as I’m trying not to order too many ingredients this year (it’s definitely my biggest blog expense), but it is on my list. Hopefully I’ll try it before the end of the year. SWEET! Thank you for providing us with an alternative to solubilizers! This is truly exciting and wonderful! 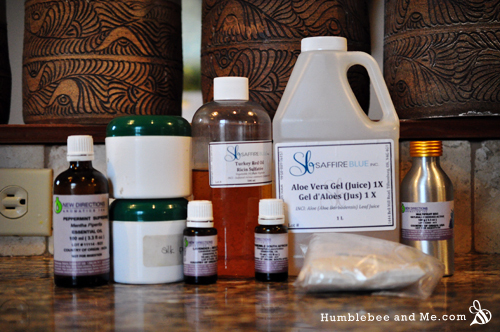 Now I’m going to try the guar gum and the Red Turkey Oil on other products that require an solubilizer! I’m so excited to finally be sharing this alternative with everyone 🙂 Once I’ve given it a more thorough shake-down I should do a full entry on it. What is the shelflife of this? Does it need to be refrigerated? I was thinking of making it for my mom and shipping it to her but I need to know if it is worthwhile since she would take the whole summer to use it up. Mine is going strong after about two months. I’ve been storing it in a cool spot, but not in the fridge. Keep in mind that this will vary depending on how yours is made and where it’s stored, but you can always add a broad-spectrum preservative (not an antioxidant like vitamin E or rosemary seed extract, neither of which will do much of anything). I’d recommend you do lots of research before choosing a preservative, many of them are quite dodgy, which is why I generally do not recommend them. So how much is a “nip”? Is that less than a pinch? A “nip” is half a “smidgen”, or 1/64th of a teaspoon—significantly less than a “pinch”, which is 1/16th of a teaspoon 🙂 I have a little set of dash/pinch/smidgen/nip measuring spoons, and the nip is the smallest of them. Bahaha!!! After our instagram conversation today about what to do with a litre of aloe juice (which I now see is the same stuff as what I have), I now have a use for it if my experiments go awry! I’ll do up a version of your spray and take it quick-like-a-bunny to work where our Pacific Coast summer is bringing in customers and co-workers with extraordinarily painful sunburns. I’ll spray them willy nilly, without their knowledge. They’ll thank me later. Can’t I add a preservative? I don’t want to worry about spoilage. Feel free to! Just be sure you are using a true broad-spectrum preservative and not an antioxidant like vitamin E or rosemary seed extract, neither of which will do much of anything. I’d recommend you do lots of research before choosing a preservative, many of them are quite dodgy, which is why I generally do not recommend them. is there an organic alternative to the turkey red oil and guar gum? i don’t feel safe using turkey red oil since it is sulfated. No, not that I know of. Turkey Red Oil gets a safety rating of 0 on Skin Deep, which is as safe as it gets. There is no remaining sulfuric acid in the final product. Well, well, well. I blame you Ms Bee! For my lack of savings that is. Went a little crazy ordering items over the past month back here in China as so many things broke in the move. And the most hilarious part was, the shop that sold guar gum only had kilo bags. The other shop that sold red turkey oil only sold by the liter. And the other shop that sold titanium dioxide only sold by the kilo. So now I’ve got all these massive bags of powder, a kilo of red turkey oil and my maid scratching her head wondering what this white chick from Canada does in her free time with all these little bottles filled with stuff and random bags of powders. Anyways, I made this spray this morning and added in some vanilla essential oil, sweet fennel and a few drops of sweet orange and it smells and feels divine! My new position has me indoors almost all the day so not too worried about the sun. Now, I just need to hurry up and use it all up or give it away so I can try another recipe! 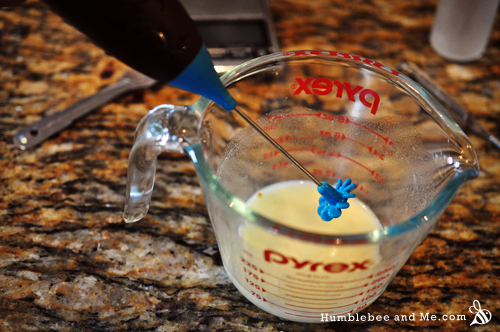 Why doesn’t yours look fully emulsified in the picture? Why does the bottom sliver look different than the rest?